Language is the human ability to acquire and use complex systems of communication, and a language is any specific example of such a system. The scientific study of language is called linguistics. Questions concerning the philosophy of language, such as whether words can represent experience, has been debated since Gorgias and Plato in Ancient Greece. Thinkers such as Rousseau have argued that language originated from emotions while others like Kant have held that it originated from rational and logical thought. 20th-century philosophers such as Wittgenstein argued that philosophy is really the study of language. Major figures in linguistics include Ferdinand de Saussure and Noam Chomsky. Estimates of the number of languages in the world vary between 5,000 and 7,000. However, any precise estimate depends on a partly arbitrary distinction between languages and dialects. Natural languages are spoken or signed, but any language can be encoded into secondary media using auditory, visual, or tactile stimuli Ð for example, in graphic writing, braille, or whistling. This is because human language is modality-independent. Depending on philosophical perspectives regarding the definition of language and meaning, when used as a general concept, "language" may refer to the cognitive ability to learn and use systems of complex communication, or to describe the set of rules that makes up these systems, or the set of utterances that can be produced from those rules. All languages rely on the process of semiosis to relate signs to particular meanings. Oral and sign languages contain a phonological system that governs how symbols are used to form sequences known as words or morphemes, and a syntactic system that governs how words and morphemes are combined to form phrases and utterances. Human language has the properties of productivity, recursivity, and displacement, and relies entirely on social convention and learning. Its complex structure affords a much wider range of expressions than any known system of animal communication. Language is thought to have originated when early hominins started gradually changing their primate communication systems, acquiring the ability to form a theory of other minds and a shared intentionality. This development is sometimes thought to have coincided with an increase in brain volume, and many linguists see the structures of language as having evolved to serve specific communicative and social functions. Language is processed in many different locations in the human brain, but especially in Broca's and Wernicke's areas. Humans acquire language through social interaction in early childhood, and children generally speak fluently when they are approximately three years old. The use of language is deeply entrenched in human culture. Therefore, in addition to its strictly communicative uses, language also has many social and cultural uses, such as signifying group identity, social stratification, as well as social grooming and entertainment. Languages evolve and diversify over time, and the history of their evolution can be reconstructed by comparing modern languages to determine which traits their ancestral languages must have had in order for the later developmental stages to occur. 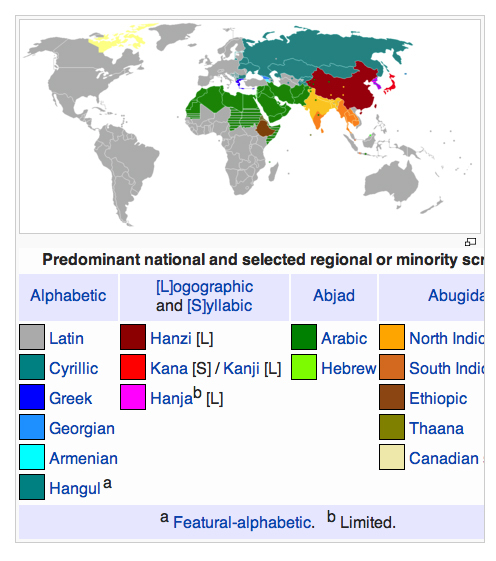 A group of languages that descend from a common ancestor is known as a language family. A writing system is an organized, regular method (typically standardized) of information storage and transfer for the communication of messages (expressing thoughts or ideas) in a language by visually (or possibly tactilely) encoding and decoding (known as writing and reading) with a set of signs or symbols, both known generally as characters (with the set collectively referred to as a 'script'). These characters, often including letters and numbers, are usually recorded onto a durable medium such as paper or electronic storage/display, although non-durable methods may also be used, such as writing in sand or skywriting. 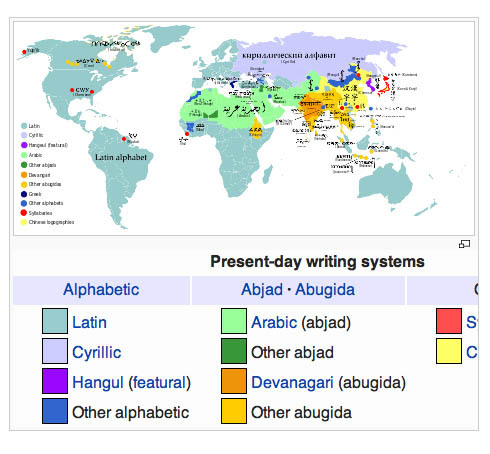 The general attributes of writing systems can be placed into broad categories such as alphabets, syllabaries, or logographies. Any particular system can have attributes of more than one category. In the alphabetic category, there is a standard set of letters (basic written symbols or graphemes) of consonants and vowels that encode based on the general principle that the letters (or letter pair/groups) represent phonemes (basic significant sounds) of the spoken language. A syllabary typically correlates a symbol to a syllable (which can be a pairing or group of phonemes, and are considered the building blocks of words). In a logography, each character represents a word, morpheme or semantic unit (which themselves can be pairings or groups of syllables). 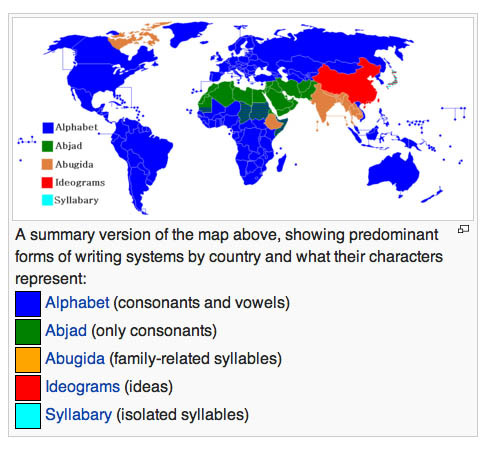 Other categories include abjads (which is an alphabet where vowels are not indicated at all) and abugidas, also called alphasyllabaries (where vowels are shown by diacritics or other modification of consonants). A system's category can often be determined just by identifying the number of symbols used within the system. Alphabets typically use a set of 20-to-35 symbols to fully express a language, whereas syllabaries can have 80-to-100, and logographies can have several hundreds of symbols. Most systems will typically have an ordering of its symbol elements so that groups of them can be coded into larger clusters like words or acronyms (generally lexemes), giving rise to many more possibilities (permutations) in meanings than the symbols can convey by themselves. Systems will also enable the concatenation (a "stringing together") of these smaller groupings (sometimes referred to by the generic term 'character strings') in order to enable a full expression of the language. The reading step can be accomplished by the reader purely in the mind as an internal process, or expressed verbally (typically, 'reading aloud'). 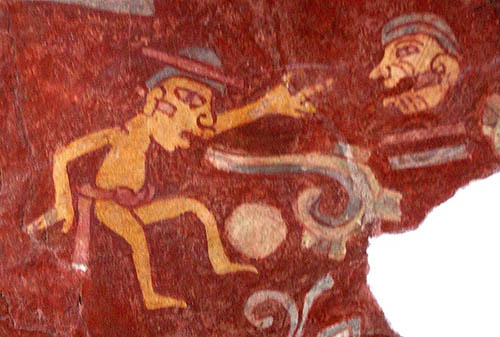 Historically, writing systems have developed after a spoken language has been established, although the individual symbols used (typically an ideogram) may have preceded the spoken word. A special set of symbols known as punctuation is used to aid in structure and organization of many writing systems and can be used to help capture nuances and variations in the message's meaning that are communicated verbally by cues in timing, tone, accent, inflection or intonation. A writing system will also typically have a method for formatting recorded messages that follows the spoken version's rules like its grammar and syntax so that the reader will have the meaning of the intended message accurately preserved. Writing systems were preceded by proto-writing, which used pictograms, ideograms and other mnemonic symbols. Proto-writing lacked the ability to capture and express a full range of thoughts and ideas. Go to WriteMyPaperHub.com to have your academic essay written!